Walking in Middle Village recently, I noticed all the cemeteries in western Queens and how many local businesses depend upon them. Death has always been big business in the Queens communities of Maspeth, Middle Village, Sunnyside, and Woodhaven, where a number of large cemeteries were instituted in the 1840s and 1850s, following the lead of Brooklyn’s Green-Wood, which was dedicated in 1838. By the 1840s, lower Manhattan was getting crowded and there was very little cemetery space. Trinity churchyard on Broadway and Wall St. was the largest; there were small Jewish cemeteries belonging to the Shearith Israel congregations, the first Jewish immigrants to New Amsterdam; and a pair of small burial grounds in the East Village—the Marble Cemeteries, as they are called, are still in existence. The proliferation of burials also led to unsanitary conditions in an era when cholera, dysentery and other germ-borne diseases were a widespread problem. New York, therefore, banned all downtown burials while keeping them legal in the more spacious Uptown Trinity Cemetery in Washington Heights, established in 1842. Meanwhile, in Queens, cemeteries burgeoned. Calvary Cemetery was established by John Hughes of St. Patrick’s Church in 1848, quickly followed by the Jewish Mount Zion; Lutheran Cemetery Mt. Olivet; and St. John’s Cemeteries. 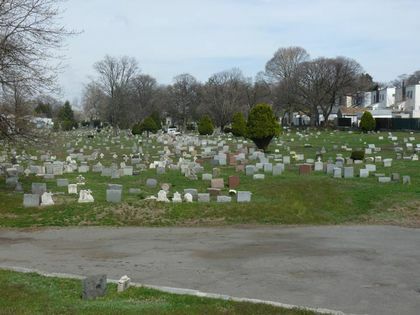 All-Faiths, originally Lutheran Cemetery, was instituted in 1852 when 225 acres of plains in Queens were purchased by Reverend Frederick William Geissenhainer. Many of the victims of the General Slocum tragedy, in which over 1000 residents of the Lower East Side’s “Little Germany” perished in a steamboat fire in 1904, were laid to rest here. A monument dedicated in their honor is found within the confines of the cemetery’s southern portion. Mt. Olivet Cemetery was founded as an Episcopal cemetery in 1850 and opened to all faiths the following year. One of the founders, James Maurice, was a U.S. Congressman, Maspeth landholder and founder of the now disassembled St. Saviour’s Church. He is buried here with his two brothers and three sisters, none of whom ever married. Compared to larger cemeteries around town like Green-Wood, Woodlawn and Evergreens, Mt. Olivet is short on star power; however, Prince Matchabelli and Helena Rubenstein are buried here, as is gangster Jack “Legs” Diamond. The cemetery, named for Jerusalem’s Mount of Olives, where according to New Testament tradition, Jesus preached, was arrested at the Garden of Gethsemane and ascended into Heaven, occupies an irregular site stretching from Grand and 58th Aves. on the north to Eliot Ave. on the south, and from the rear of properties on 68th St. on the east to the rear of properties on 58th Rd., 66th St., 59th Ave., 64th St., 60th Ave., 66th St. again, 60th Rd., and, of course, Mount Olivet Crescent, on the west. This building dates from 1902 and was originally the summer home of a local politician. In 1920, John Miller purchased the home and established his funeral parlor here. 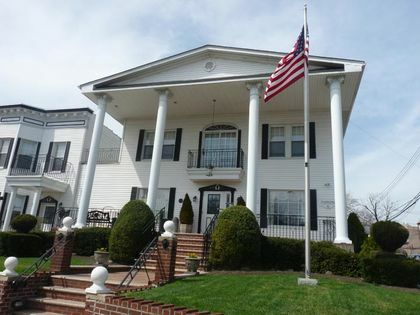 When Arthur Hess partnered with him in the 1940s, it then became the Hess-Miller Funeral Home. It’s still in business under the same name, although no longer owned by either family. The Fresh Pond Crematory is a handsome Beaux Arts building sprawling along Mt. Olivet Crescent and 65th St. north of 62nd St., facing All-Faiths Cemetery. It was built in 1884 when cremation as a burial choice was a novelty. 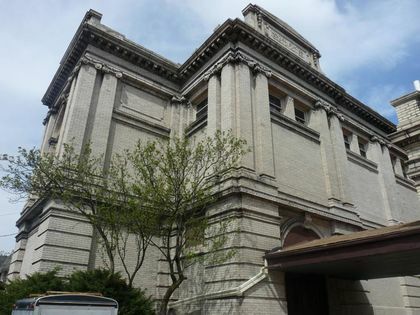 The building is a wonderful pile lined with Ionic pilasters, or half columns (the place is also called a “columbarium,” Latin for “column,” which has its roots in Columba, dove; doves build nests that have niches that resemble small columns). Surprisingly, the gates are open during the week, and it’s easy to stroll onto the grounds to have a look. This is the third crematory constructed in the United States—two in Pennsylvania are older. Two expansions since the original was constructed, the last in 1910, brought the building to its present size. The building also serves as an archive for every cremation since the beginning, as well as a repository for decorative urns bearing the cremains—arranged in compartments bearing multiple niches, hence the name columbarium. There are 16,000 such niches here, each bearing one to nine cremains. The process of cremation converts a corpse to ash. The corpse is exposed to temperatures of 1600 F. Even after that, there are some bones remaining intact and have to be processed further. It costs approximately $300 depending on the crematory, and can be considered more cost-efficient than burial. My father’s remains were cremated (per his wish) and I placed them in the same plot with my mother and grandmother in St. Joseph’s Cemetery in Troy, New York, from where my mother hailed. Only recently has the Catholic Church lifted its ban on cremations. Famed “clients” at Fresh Pond Crematory include Lou Gehrig, J.P, Morgan, the Notorious B.I.G., and silent-era comic Fatty Arbuckle. 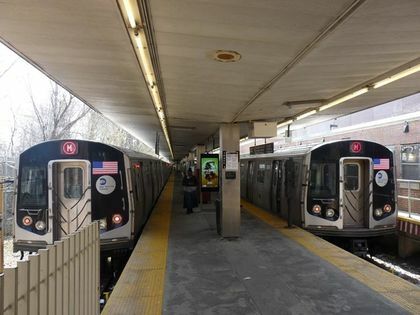 Throughout its existence a consistent terminal has been Metropolitan Ave.—the route originated as a steam railroad running to the cemetery in the late-1800s. The terminal was suburban in aspect since its original station house remained in place until 1974, when it burned down and the modern brick structure that replaced it was constructed. At the northeast corner of Metropolitan Ave. and 69th St., with All-Faiths Cemetery across the street, we come to one of my favorites in these parts, the Frank T. Lang Building. It was built by Lang, a mausoleum and monument manufacturer, in 1904. During renovations in the 1990s, a Bohack gasoline station sign was revealed there; Bohack made a foray into auto parts distribution in the early 20th Century. Lang went out of business in 1946 and the building has seen mixed use since, with an auto body repair shop on the ground floor for the past several years. My favorite feature is the group of laughing cats that guard the roofline on the chamfered edge of the building. East of 69th St. there’s a brief interruption in All-Faiths Cemetery on the south side of Metropolitan. Currently the space is partially filled by an Arby’s. 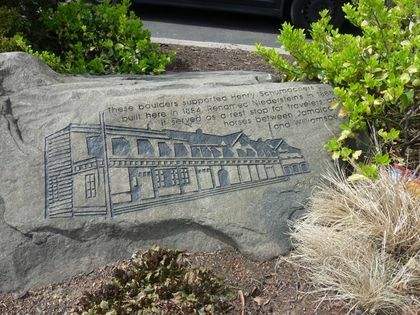 On one of the rocks guarding a driveway there’s an etching depicting a lengthy, two-story restaurant called Niederstein’s which formerly occupied the space. Built by Henry Schumacher in Middle Village about 1854, this building became John Niederstein’s hotel and restaurant in 1888. It originally served as a rest stop patronized by those hauling their goods between Jamaica and Williamsburg via the former tolled turnpike. In the 1970s, the hotel was modernized by its new owners, who removed the porch and carriage sheds to make way for small parking lots. It ceased functioning as a hotel many years ago. Niederstein’s served typical German fare and in recent years catered mainly to funeral and wedding parties as well as loyal locals. There was no joy in “Midville” when the restaurant closed in February of 2005 and was sold to a fast food franchisee—Arby’s, which eventually razed the building. 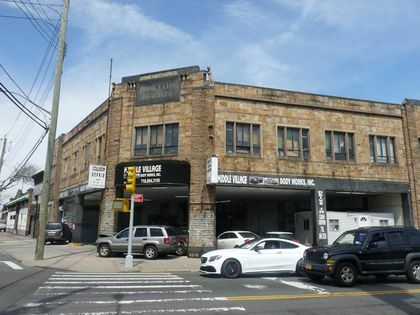 Over the years its interior and exterior had been altered to such a degree that it was deemed unworthy of protection by the Landmarks Preservation Commission. Arby’s throws a bone to the locals with painted depictions of Niederstein’s and photographs of Metropolitan Ave.’s old trolley line within.